By installing it between the lens and the camera body, KENKO TELEPLUS PRO 300 DGX 1.4x increases the effective focal length of your lens by 1.4x. Precisely made in Japan and compatible with a wide range of genuine cameras and lenses, it is particularly helpful for those professional photographers as well as amateurs who may need a tele lens but feel no reason to purchase a new expensive one due to low frequency of use. 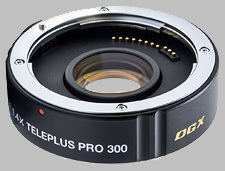 Kenko Teleplus PRO 300 DGX 1.4x tele converter is a high precision manufactured optical device to be installed between the camera body and the master lens. Its purpose is to multiply the focal length of the lens according to its multiplication factor, changing your lens into a tele lens, with minimum loss of resolution and sharpness of the image. For example, an 1.4x Tele converter can turn a 70-200mm lens into a 98-280mm lens. The Kenko PRO 300 DGX is a premium series of tele converters specifically designed to be used with high-resolution DSLR cameras and lenses. Complete communication and signal integrity between the lens and camera body for secure autofocus, aperture and data calculation functions. Ability to convert and record EXIF data within the image. Teleplus tele converter can in fact record the equivalent aperture and focal length of the lens according to the multiplication factor of the converter. High quality optical elements, as well as other parts, due to its precise manufacturing in Japan. Compatibility with a wider range of Nikon and Canon lenses, marking it as the most versatile accessory among those usually chosen by photographers. Kenko Teleplus tele converters can dramatically change your photos by making the object appear larger in the image and yet maintaining its high resolution and quality. This result can be achieved by simply using this lightweight and compact tele converter even if you do not have or cannot afford a good and powerful super tele lens. *NOTE: Canon EF lenses only. Canon EF-S lenses are not compatible. Kenko Teleplus PRO 300 DGX tele converters are compatible with only genuine lenses (Nikon and Canon) and Tokina lenses (except Tokina AT-X 70-200mm F4 PRO FX VCM-S). Other manufacturers lens and camera models are not supported. This is one of the best camera gadgets I have ever used. I've had the DGX model since it was first introduced, and it has resided on my Nikon 70-300 VR lens since then. It autofocuses almost perfectly on my Nikon D7100 with that lens and also with my Nikon 18-140 all the way out, at f/5.6. With my 28-105D, autofocus is always perfect. Only with low contrast shots, e.g., with the 70-300 lens out at 300mm, where the lens itself is a bit soft, it will sometimes search for focus. But that is the fault of the particular lens at 300, not the TC. At 250mm or less it always focuses perfectly on that camera. On my D610, with the 70-300 at 300mm, it sometimes searches, but almost always autofocuses up to about 250mm. I very seldom remove it from my 70-300, and only do when I want to use the lens for closer shots. I've never found any optical imperfection in it. Maybe people who love to shoot test patterns will find some distortion or softness. But I have never detected any reduction in resolution or any distortion in my images. Lightweight and small. You will forget it's attached. I bought this teleconverter to use with my macro lens,to increase their magnifacation. What a supprise I got when I decided to try it on my Nikon AF 70-300 VR lens. When I couple this lens and the teleconverter to my D300s, I wind up with a VR lens that has a reach of 630mm. The AF works flawlessly. Focusing is a little slower, but that is a small price to pay to have a VR lens with a 600+mm reach for an additional investment of $119. This Tele is simply an absolute steal. Just bought this new, and having focus searching problem on my Sigma f2.9 70-200HSM. Will not stop searching. Does not do this with my other 'shorter' zoom - Nikon 18-79, Sigma 24-135, & Tamron17-50. anyone know - what's up?? This complements my Kenko 300DG pro 2X well giving me a 98-280 and 140-400. Needs to be stopped down 2/3 stops for optimal resolving power. I use it to extend my Canon EF 135mm F2 L to an 189mm F2.8, which means that I (almost) have 200 mm length without noticeable loss of AF speed or IQ. Compared to the 1.4 Canon TC, it has a lot of pros : it is light, black, can be used on much more lenses and more than 2 times cheaper ! I use it on a Canon USM 100mm f2 on a 350D (Rebel XT), which gives a real 160mm f2.8, and the 35mm equivalent field of view of a 224mm in a very compact set up. I haven't tested the Canon, but for my use I really see no reason to put a twice the price, twice the weight big white TC between my small black lens and my small black body !! The king of all the Tcs! Though it's made of plastic, the build quality is fine for what it's required to do. Note that there are no weather seals on this TC. This TC gives you more reach without sacrificing image quality, Unlike its x2 sibling.